A real powerhouse, tea tree essential oil is one of the most versatile and popular of all the essential oils. It is inexpensive, extremely practical and confers such a wide range of health benefits that it should be a staple of any medicine cabinet. Tea tree oil which is also known as melaleuca oil is derived from the leaves of the Maleleuca alternifolia or the tea tree plant which is a native of Australia. Its common name was originally coined back in the 18th century by the famous British explorer James Cook who observed the indigenous people brewing a tea from the leaves. James Cook actually made his own tea from the leaves to prevent his crew from getting scurvy. The native Australians had long been familiar with the healing properties of the tea tree long before Australia was discovered by the Western world and according to historians the leaves were commonly used by aboriginal communities to treat infections, burns and cuts. Modern research into tea tree oil dates back to the 1920s when an Australian researcher called Arthur Penfold began to investigate its antiseptic abilities. At around the same time surgeons and dentists started using tea tree oil to prevent infection and clean out wounds. Research tells us that there are well over a hundred components in tea tree essential oil but it is largely composed of terpinen-4-ol, gamma-terpinene, 1,8-cineole (eucalyptol) and alpha-terpinene. Antimicrobial properties: Since Arthur Penfold discovered its outstanding antimicrobial activities nearly 100 years ago, numerous studies have confirmed that tea tree oil is one of the most powerful natural antibacterial and anti-fungal substances. Expectorant properties: which make tea tree oil ideal for treating respiratory conditions. Cicatrisant properties: meaning that the oil can help heal skin wounds quickly and even help to diminish the appearance of scars. Anti-inflammatory properties: terpinen 4-ol which is the major chemical component of tea tree oil has excellent anti-inflammatory actions giving tea tree oil a variety of uses including muscular pain and arthritis. Insecticide properties: as well as its myriad health benefits, you can use tea tree essential oil to repel insects and kill ticks, mosquitoes and fleas. Tea tree oil is commonly used to treat numerous skin complaints as well as for purely cosmetic reasons. It can increasingly be found in a variety of skin care products like creams and soaps because of its proven benefits. For Acne: Tea tree essential oil is regarded as one of the best home remedies for those suffering from acne. Studies have actually confirmed that tea tree oil is a very effective remedy which offers natural hope to the millions of sufferers worldwide. To treat your acne with tea tree oil, simply dilute your oil in water or with a carrier oil and apply it to the affected areas of your skin. Alternatively, you can add it to your regular lotions or creams. For Eczema and Psoriasis: As well as being very effective against acne, tea tree oil is commonly used to great effect against other chronic skin conditions like eczema, psoriasis and rosacea. Its anti-inflammatory abilities help to soothe any redness and itching while its outstanding antimicrobial effects can help fight infection. Add about ten drops of your tea tree oil to a base oil of your choice. Coconut oil works especially well on inflammatory skin conditions. Massage the mixture into the affected areas. You should start to notice the improvements in no time at all. There is a large body of scientific evidence that demonstrates the promising antibacterial potential of tea tree oil and confirms its traditional use among the aboriginal population of Australia. If you find yourself with an injury like a burn, scrape or a cut, tea tree oil is a great remedy to have on hand. I actually used it recently when I embarrassingly managed to put my motorbike down and it certainly seemed to do the trick. Tea tree oil is one of the most effective anti-fungal oils yet discovered. It can be used to treat a range of common fungal infections including athlete’s foot and nail fungus. A study published back in 1999 demonstrated just how effectively toenail fungus could be treated with tea tree oil. To treat nail fungus simply add a drop or two of tea tree oil to the affected nail and the surrounding area of skin several times a day until it is healed. To treat athlete’s foot, make sure that you clean your feet well and apply diluted tea tree oil to your feet each day until the complaint has resolved itself. Jock itch is another common fungal disease that tea tree oil can be used to treat effectively. Before applying the oil to your skin, be sure to dilute it with a quality carrier oil like olive oil or sweet almond then apply a thin layer to that affected region each day. As a child, I suffered from several large warts on with side of my thumbnail. They were not especially problematic but they were sufficiently embarrassing for me to hide my hand from view when possible. Before I go on to look at the range of oral benefits that tea tree oil has, it is important to note that tea tree oil may be toxic if it is ingested so be very careful when treating your teeth and gums that you do not swallow any of the oil. A number of studies have demonstrated just how effective tea tree oil can be for treating oral and tooth infections. Toothache and tooth infection can be extremely painful and most of the time requires antibiotics to treat. For those of us who are conscious of the problems associated with the overuse of antibiotics, it is great news that tea tree oil as well as several other essential oils like clove and peppermint can be used to treat the problem naturally. You can make your own mouthwash by adding a few drops of tea tree oil to a glass of water and gargling with it but be careful not to swallow any in the process. Simply apply a drop of tea tree essential oil to your cold sore with a Q-tip each day until the sore has dissipated. 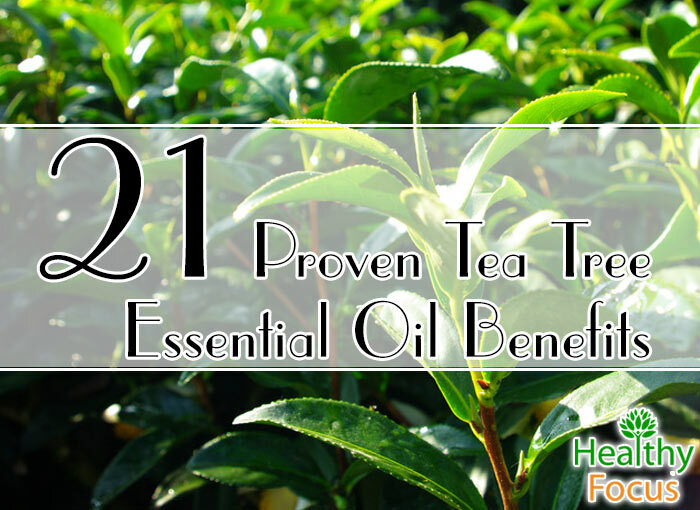 Tea tree oil is very beneficial for the hair and the scalp. When massaged into the scalp it can help moisturize and soothe the skin and help remove dry flakes such as dandruff. As well as helping your hair achieve a more glossy appearance, it can even help to kill and prevent the recurrence of lice. You can easily make your own home made tea tree oil shampoo by adding a few drops of tea tree oil into your regular shampoo or combining it with lavender oil and coconut milk. Asthma is not a condition to be taken lightly so make sure that you see your doctor if you suffer from a serious attack. Some people have found however that tea tree oil can help treat their symptoms and help them to breathe more easily and freely. The best way to treat your symptoms is to add a few drops of tea tree oil to a bowl or sink full of very hot water and inhaling the vapors. As well as the symptoms of asthma, you can use tea tree oil in exactly the same way to treat other common respiratory conditions like sinusitis and bronchitis. While steam inhalation is extremely effective, you could alternatively massage the oil into your chest and throat but make sure that you dilute it with a carrier oil before applying it to the skin. To treat common coughs, simply adding tea tree oil to your diffuser machine is very effective. To treat an earache or an ear infection, you should first combine two or three drops of tea tree oil with two tablespoons of warm olive oil. Using a dropper, simply tilt your head and drop a little of your oil into the affected ear. Allow it to absorb for a few minutes then use a cotton bud to clean out any excess oil. Repeat the process twice each day until your earache has gone away. Because it has such excellent soothing qualities and such effective anti-inflammatory properties, tea tree oil makes an excellent ingredient in a massage oil. It can be used to treat joint pain caused by rheumatism and arthritis as well as for gout or simple muscular pain caused by exercise or a hard day on the feet. To treat muscle or joint pain, dilute your tea tree oil with a carrier oil and then rub it into the affected joints and muscles. Alternatively, you can add a few drops to your bathtub and let the healing goodness soak into your skin. If you have a sore throat or tonsillitis, then you can make a gargle remedy by adding a few drops of tea tree oil to a glass of warm water and a touch of salt. You can treat your sore throat by gargling with it several times each day but be very careful not to ingest any of the mixture. There is ample evidence that tea tree oil has outstanding abilities against yeast and fungus that cause vaginal infections such as candida. You can treat candida overgrowth by diluting your tea tree oil and applying it directly. For a gentler treatment just add it to your tub of hot water and allowing it to soak up naturally. A 2004 study compared a 10% Tea Tree Cream and 5% body wash regimen was to standard MRSA eradication method for hospital patients. If you were not already impressed enough by the vast range of health benefits that tea tree oil offers, then there’s more. This remarkable oil can also be used for a variety of practical and household functions. You can naturally eliminate all trace of body odor because of tea tree oil’s excellent antibacterial properties which help destroy the bacteria causing your unwanted odors. It is easy enough to make your own deodorant by mixing a few drops of tea tree oil with coconut oil and some baking soda. Apply it each morning to keep you smelling fresh all day. Tea tree oil has insecticide properties that will keep nasty creepy crawlies like ants, silverfish and mosquitoes at bay. You can diffuse the oil around the house to deter these unwanted guests or make your own repellent spray by adding 10 to 15 drops to a spray bottle full of water. Believe me, this remedy works wonders. It also works to get rid of demodex mites. Believe it or not, adding a few drops of tea tree oil to your laundry can help keep it smelling fresh and also help prevent mold from taking hold of towels and other fabrics prone to mold. The build-up of mold in certain areas of your home is a very common problem especially in areas of the house that are prone to getting damp. You can use tea tree oil to kill of this nasty mold and other harmful bacteria by either diffusing it around the house or adding a few drops to a spray bottle of water and using it to spray down certain areas of the home such as your shower curtains and refrigerator. Tea tree oil is generally safe. Allergic reactions are possible so when applied topically but you should dilute it first and also perform a patch test to ensure that you do not react to it. Tea tree oil is not considered safe for digestion so be sure that you do not swallow any of it if you are using it to treat any oral conditions. Tea Tree Oil may have a mild estrogenic quality (as does Lavender oil). Avoid Lavender and Tea Tree oils in people with estrogen dependent tumors.